A mailbox began as only a simple box to hold letters, it slowly turned into a decorative street ornament for each individual house. Mailboxes made the journey from the wall next to the front door to their own freestanding spot by the street in front of the house. Some people choose a simple metal box but others have quite extravagant mailboxes. 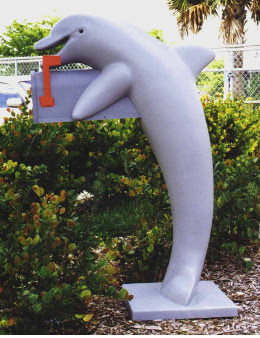 Recently I was in Naples, Florida where I saw quite a few mailboxes in the shape of a dolphin. Some people even have mailboxes made to resemble their own houses. There are mailboxes made to look like planes, trains and automobiles. Some simple metal mailboxes are painted to be made into so much more. When you drive down the street you no longer see the same plain mailbox instead you see many different takes on the once simple letter box. Mailboxes are used to signify major events. They are decorated for holidays, parties and the birth of a child among other things. A mailbox has become a way to identify a house not only by the numbers that signify the address but also by the make of the mailbox. Something so simple and everyday has become modern day art.